A nine year old boy‚ resident of the Shalhevet neighborhood near the Settlement of Yitzhar in Samaria‚ was lightly wounded early Shabbos morning after being stabbed by a Palestinian who infiltrated the neighborhood . A nine year old boy, resident of the Shalhevet neighborhood near the Settlement of Yitzhar in Samaria, was lightly wounded early Shabbos morning after being stabbed by a Palestinian who infiltrated the neighborhood . Rescue services who were called to the scene evacuated the boy to the hospital with stabs to the back and injuries to his hands. He is currently hospitalized after having the cuts on his back and hand stitched up, and is expected to be released soon. 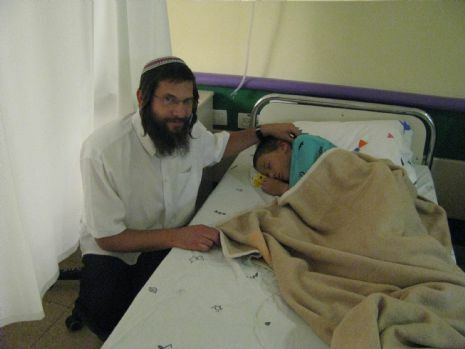 The staff of Chabad’s Terror Victims Project, along with Rabbi Motti Gorelik, Shliach in Petach Tikva, visited the child in the hospital bringing him treats and cheering him up with words of strength and encouragement. The spokesperson for the settlement of Yitzhar, Yigal Amitai, relates, “around 6:20 AM, the terrorist came from the Arab village Asira al-Kabaliya and encountered a soldier at the checkpoint near the Shalhevet neighborhood, who allowed the terrorist to pass, in the words of the soldier, “I didn’t know that we’re dealing with a terrorist”. The terrorist entered the Ben-Shlomo family home in the Shalhevet neighborhood and burned it to the ground. From there he headed toward the Ofen family and attempted to enter their home. Mrs. Rotel Ofen fought with the terrorist, and he escaped. He noticed a 9 year old boy, stabbed him in the back and hand and threw him off a porch down a 5 meter incline. From there the terrorist escaped back to the nearby Arab village of Asira al-Kabaliya. Tzeirei Chabad’s Terror Victims Project will continue to follow the rehabilitation of the boy, and will make an effort to assist as much as possible.